Which coast better satisfies your stomach? It’s an age-old rivalry between the East coast and the West coast. But if we’re going to go toe to toe we might as narrow it down to two of America’s hottest cities: NYC and LA. Question is, which city has the better options? Let’s break it down. Trendy foods, come to the table. Whether it’s cold or hot (or hot all year round), ice cream is undeniably the go-to comfort food for any occasion. When we stress, it’s ice cream that keeps us sane. When we celebrate something, ice cream. In LA, one name might spring to mind and it isn’t Ben or Jerry. Diddy Riese, or ‘Diddy’s,’ is known for its ice cream sandwiches. The shop has been opened since 1983 and is extremely popular with the UCLA kids who no doubt feel that the long lines are worth the wait. Word on the street is that their white chocolate chip cookies with peanut butter ice cream is better than anything on the East coast (although pretty much everything on the menu is fair game). But NYC has their own ice cream tradition that every blogger known to man has probably Instagrammed on their trip to the big apple. Momofuku Milk Bar is famous for its cereal milk soft serve, which is essentially a frozen version of the sugary milk left behind in a bowl of Frosted Flakes. In NYC, Francois Payard Bakery sells their macaron ice cream sandwiches only during summertime but New Yorkers would probably agree that they’re so worth waiting for. They’re not traditionally shaped like macarons but more like sandwiches. The longer, more rectangular shape actually makes it a whole lot easier to eat—convenience and taste all rolled up in one. 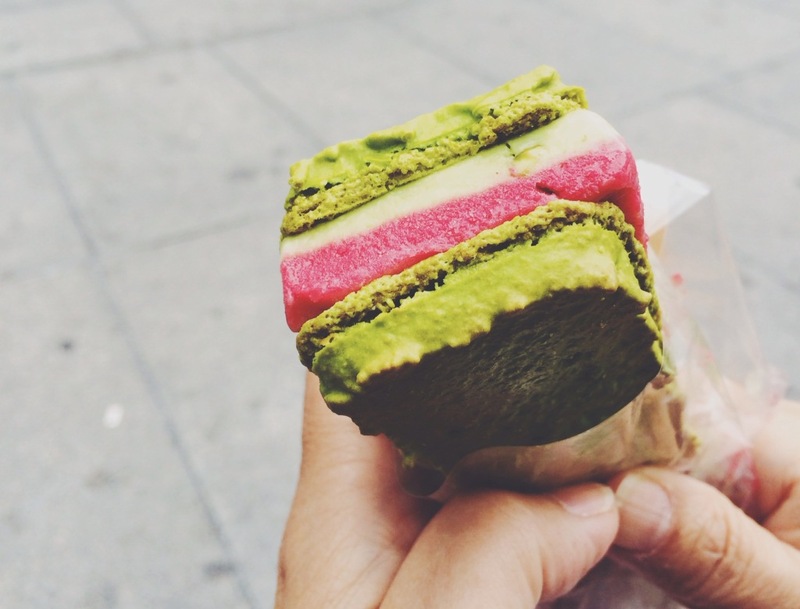 In LA, Milk is the go-to place for macaron ice cream sandwiches. You can either make your own (for the same price) or try their Thai tea macaron ice cream sandwich, which is a fan favorite. One downside is that people have said it was a bit on the sweet side so if you’ve got an especially sweet tooth this is your place to be, otherwise NYC wins this overall round. 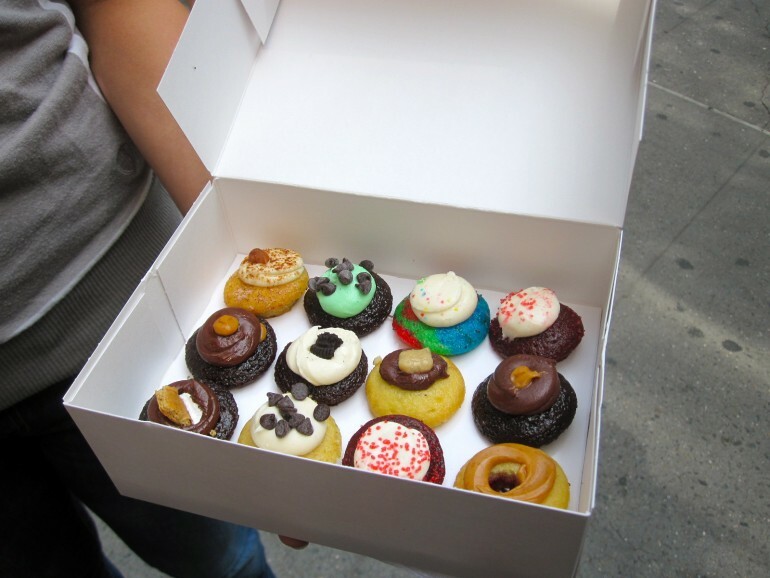 Less is more, at least according to NYC’s top cupcake spot, Baked by Melissa. These famous cupcakes are known for their miniature bite-size sweetness. Whether it’s peanut butter cup, s’mores, tie dye or red velvet you’ll be hooked in a matter of seconds. They’re only 50 calories or less per cupcake— pretty hard to beat that number don’t you think LA-ers? In LA’s corner is Big Man Bakes. Their cupcakes also come in mini sizes, but you’re better off sticking to the regular because once you’ve had a bite of their famous carrot cake cupcake you won’t be able to stop. Moist and fresh, these cupcakes are truly “go big or go home,” which I can’t argue with. The acai (ah-sah-yee) bowl, the latest frozen health treat, is making its rounds in NYC and LA. It’s made up of a frozen, blended acai berry topped with granola or fruit depending on your preferences. It’s the perfect breakfast or snack, and nobody does acai bowl better than America’s cosmopolitan cities. You can find it in almost all juice bars in NYC, but Liquiteria has got the acai bowl down to a tee. Try their Mean Green Acai Bowl with almond butter on top, a combination guaranteed to send you straight to healthy heaven. Speaking of heaven, LA has their own version of the Acai bowl—the Maca bowl, sold exclusively from Liquid Juice Bar. The bowl is huge but you definitely feel like you’ve spent your money wisely —$9 to be exact, so make sure you try out the Cliff Hanger bowl or the Pitaya Bowl for local favorites. It doesn’t matter if you’re on the east coast or the west coast, there’s something about ridiculously long lines that somehow make you want to stand in them and see what all the fuss it about. Ippudo in NYC has people waiting outside of their East Village location constantly. The trick is to go at a random time—Tuesday at 3:30pm anyone? But when they’re closed, they mean it. The doors blend into the wall and you wouldn’t even know you just walked passed one of NYC’s hotspots. NYC might have the lead in this round just for their cool architectural designs alone. 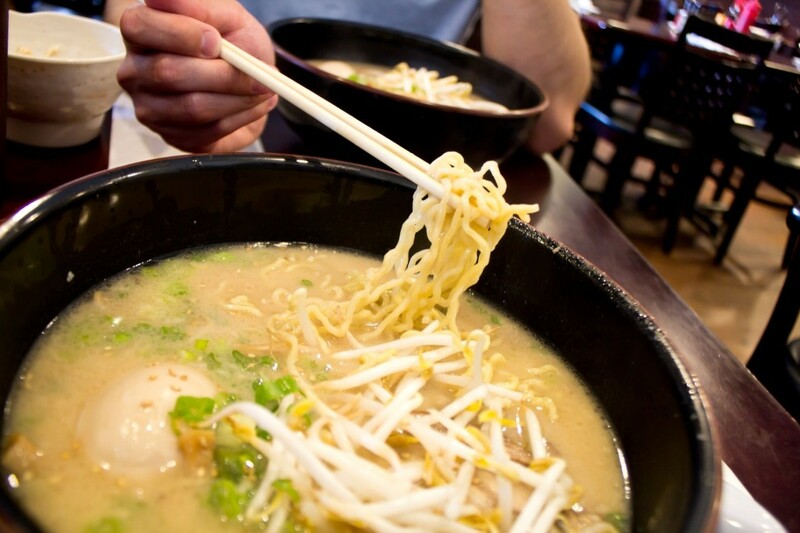 But over in LA, you’ll be met with another tempting choice—Daikokuya. The wait time is typically around 45 minutes to 1 hour, compared to Ippudo’s minimum 2-hour average wait time. Patience is a virtue but when you wait for food it’s not the same thing. You win this round LA. Before we even mention their names, it’s pretty obvious that the rivalry between Shake Shack and In-N-Out Burger is one of the biggest food debates in the history of burger lovers everywhere. With so much hype, you’d think these places are way overrated. Nope. Only in LA will you see a line of cars wrapped around an entire building late at night just for a burger or two. But the thing about In-N-Out Burger is that it’s not just a burger, it’s a cult. Even people from LA in NYC dream about the day they go back home for some comfort food. But NYC’s Shake Shack’s burgers, thick shakes and crinkle cut fries are to die for not to mention they have their special Shroom burger for vegetarians. You’ve got to give it up for a place that thinks of everyone’s dietary needs–this round goes to you NYC. Agree? Disagree? Share your rants in the comments below.